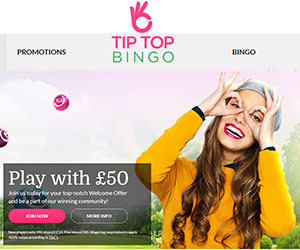 Tip Top Bingo Review | Play with a £30 bonus + 50 Free Spins! Ready for a tip-top time, and fresh new bingo experience? Well stroll into the world of Tip Top Bingo, the newest site to explode onto the market for 2016! Produced by the talented Tarco team, the same forces behind Loony Bingo, the site has become the latest hot DragonFish network addition. Offering a breath of fresh air from a typical bingo site, the splash screen welcomes you to a scenic park scene with a fun character making the Tip Top sign. The site sets itself apart from the rest with it's authentic, down-to-earth feel, great rewards and more wins! Each and every promotion, game and unique feature has also been carefully created for players and their gaming pleasure! Tip Top offers an impressive pink, green and white interface with cutting-edge features. These include a Live Bingo feed with the latest games, rooms and jackpots, and Live progressive IG updates. You can also access Free spins from the home page and there are exciting Live Chat options. Another highlight is Tip Top's transparency. This means that with each promotion and game, you won't have to sift through the small print to find out all the T&Cs. These will be clearly presented in the promotion! There are also a wealth of games to cater to every budget, with more rewards, and even more chances to win! You can expect a top-notch welcome bonus party with Tip Top Bingo! When you can add just £10 to get your £20 bonus + 50 free spins to start your high-rolling experience with £30. On your second deposit, you can cash in on a 100% Bingo Bonus plus 10 Free Spins to Fluffy Too, You can also grab a 100% Bingo Bonus, plus 20 Free Spins for Enchanted Prince on your third deposit! The perks don't end there as you can bag yourself all kinds of juicy treats. You can play once and turn your bonuses into real cash, earn Free spins for playing slots games, and win 100,000 coins to have another shot. There are also promos like the £200K Sure Win, mystery bonuses, life changing jackpots and £500 cashback each month! It's also a good idea to stick around, as you'll be rewarded for your loyalty with points to win monthly restaurant, spa and hotel vouchers! You can also bag some extra bonus cash for inviting all your friends to the site. Plus hang in the winning Live Chat community for more exclusive games and prizes! The games section has been designed with unique features to make your stay as easy to navigate and fun and as possible! There is a BOGOF feature screen to show how many cards you have and which cards are free, and a rich collection of mini-games. While you play, there are options to minimize the chat feature. You can also access Free Spins from the Homepage and lobby, and there is a feed with the latest winning details for bingo, slots and casino games! It can be bingo time, all the time with Tip Top's first class collection of themed bingo games like 75 ball, 90 ball, High 5 Swedish and penny bingo games. You can dive into the action with mini instant games, live bingo and break the house with daily guaranteed jackpot and progressive games. Tip Top has also tripled your chances on bingo, and has made sure there are more wins in every game, as 95% of the games have 1TG & 2TG winners! Next you can hit the slots to play over 200 old classics and new IG games with huge payouts like Rainbow Riches, Starburst, Cleopatra, Fluffy Favourites, Fluffy Too, Gonzo's Quest,plus jackpot games like Millionaire Genie. You can then take your seat to enjoy exciting table games like poker and baccarat, with plenty of monthly casino bonuses and chances to win! Continue the adventure on your mobile devices like iphone, ipad and tablets to access heaps of games on the go! You can also enjoy your bonus, more rewards, more chances to win and jackpots galore!